Forever 21: Up to 75% off and free shipping on orders over $11.00! TOMS: TOM’s is offering a 20% discount on all full-priced styles to veterans and active military members in honor of Veterans Day. New Balance: Save 20% off apparel when you use the code “CELEBRATE” through November 20th. Nordstrom: Through the weekend, save up to 40% on home goods and apparel. If you don’t go shopping, and even if you do, say thank you to a service person. Think about how lucky you are to have the freedoms that you do, and live your life to the best of your ability. Personality is all about expressing yourself. This expression can be through how you talk or how you move, how you draw or how you write, as long as it’s a meaningful expression about who you are; it can be through any medium. A personal medium that I happen to love is journaling. 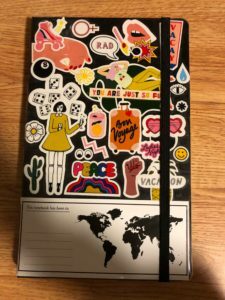 In high school I kept a bullet journal every day, but while getting into the swing of things in college, I had a bit of trouble finding the time to write daily. Cover: This won’t be monthly, but I’d like to pull attention to the cover of the journal. It speaks volumes about who you are, and should be filled with encouraging words and happy thoughts if you choose to decorate it. Plain is beautiful too, as long as it speaks to you. 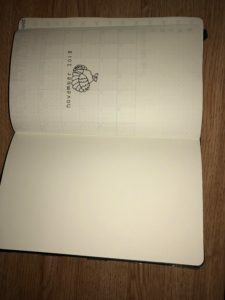 Simplistic monthly cover page: In my cover page for November, I chose to choose a minimalist design of just writing the month with a small sketch of something that, to me, represents November: a turkey. No matter what route you choose, this one is definitely allotted the space for the most artistic freedom, so make it known! Calendar: My calendar is smaller than most, but I felt it appropriate for this warm and cozy, small, and comfortable month. Spanning two thirds of a page for blocks, and using the fourth section as a segway for the notable moments section, this page is evenly dispersed with a artistically sculpted title at the top; month and year. 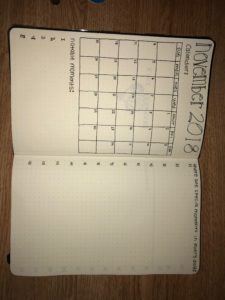 Journaling Section: My journaling section comes right after the calendar. I allotted three lines for every day’s events to be more thoroughly explained. BUT, at the end of the section I issued a “continued” page where all information can be continued to be written if it is deemed as important enough to be. You must be careful when having this section however, it fills up fast. 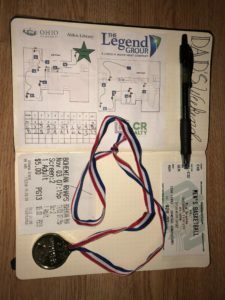 Example: Lastly is an example of my spread, the first weekend of November was Dad’s weekend, so I featured our Alden putt-putt scorecard, basketball game tickets, and movie tickets. However, I have not completed the writing portion, and will debut how it turned out in next month’s edition! As a disclaimer, I love all types of journaling, but bulletin is definitely my favorite. 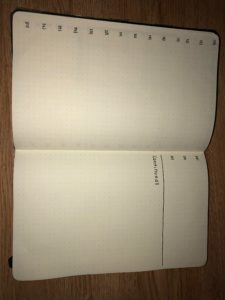 You don’t have to follow this template, you don’t have to bullet journal, and you don’t even have to do any other type of journaling, but just promise me that you’ll start doing something therapeutic that makes you happy every day. Even if you don’t know what that this thing is or should be, I recommend journaling. We’ve been waiting for it, we’ve been pleading for it, we’ve even been begging for it. But now that it’s here, we’re going to have to figure out how to deal with it. It seems that this year we went from 90 degrees and sunny to 40 and cloudy in mid-October in a matter of a day. We may have skipped most of fall, but we need to make sure that we are as stylish as we can be while staying warm as the leaves turn orange. 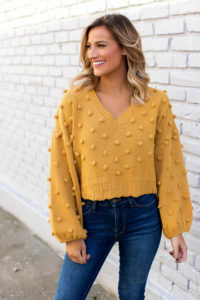 Ladies and gentlemen, there is a reason that it’s called sweater weather, and that’s because it is the perfect garment to wear on these cool fall days. Too cold for a t-shirt, too warm for a jacket- the sweater is the perfect in-between. These perfect in-betweeners are warm, and better yet there are hundreds of styles to choose from. Here are our top styles for the fall of 2018. Chunky: Nothing keeps you warmer than layers and layers of fabric, and nothing does layers of yarn better than chunky sweaters. As the temperatures drop, these will rise in popularity! Always keep your eye out at thrift stores and retailers for the best chunky sweaters. Cropped: Stay cute and cool for those days when a sweater is perfect in the morning, but scorching by late afternoon. Cropped sweaters can show off your figure and personality, being an easy DIY for anyone. Just make sure that if you do it yourself, you don’t cut it too short. Argile: This trend has always been around, and always will continue to be. 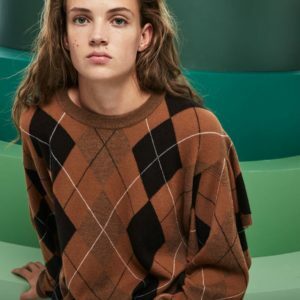 Looking old school has never been more cool than in the fall months with an argyle sweater. Keep it classy and keep it preppy all fall. 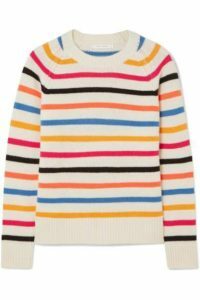 Striped: Spongebob knows it, we all know it – the best time to wear a striped sweater is all of the time! And the absolute perfect time to wear a striped sweater is in the fall! With all of the muted colors, you need to make sure that you pop! Off The Shoulder: Cute and comfy with a dash of uniqueness. 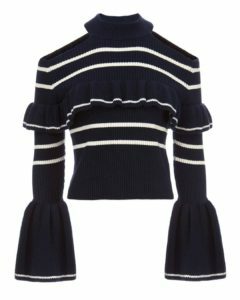 Any off-the-shoulder sweater will be an eye-catcher! Warm, but keeps you cool enough to show off your style. Whatever you wear this fall, just know that it should be completely, and undoubtedly- YOU! This company, founded in 2003 by Mike Karanikolas and Michael Mente, has been reportedly on track to make over one billion dollars in sales this year. Revolve is known for its daring, trendy clothing, and according to the Wall Street Journal, may be preparing for an initial public offering later this year. The company’s founders are unique in having had no fashion experience before this adventure, and have found their success through analytical planning and trend following. They are goal driven and primarily focused on one group of people, millennial women. They have been successful so far at avoiding controversy. That is until this fall. Revolve has pulled the sweatshirts from the site and has promised to donate 20,000 dollars to Girls Write Now, the charity LPA had planned to give proceeds from the collection to. Hopefully, this was a warning to other companies to shy away from prematurely releasing clothing without context, or even releasing clothing that can cause controversy by harming others. Revolve’s stocks have not dropped in turn, and neither have their profits, but their customer loyalty is set to suffer. Let this be a lesson to everyone, when it comes to fashion, play it safe- but play it smart. Play it kind, and play it well. Especially when it comes to millennial women. As much a political statement as a fashion statement, man-made fur has been around the block for a while now. In the past, real animal fur was seen as an almighty sign of wealth, pride, and beauty, but as time went on and customers learned of the injustices against animals used to get the fur for their beloved products, outrage against real fur was abundant. Recently, as more and more designers, companies, and shows have banned real fur, even as far as London’s Fashion week, people have been coming back to this reliable alternative. According to madehow.com, “Fake fur is a type of textile fabric fashioned to simulate genuine animal fur. It is known as a pile fabric and is typically made from polymeric fibers that are processed, dyed, and cut to match a specific fur texture and color.” This means that it’s almost exactly the same as real fur, people can’t even tell the difference, and there’s no cruelty to animals when it comes to faux fur. Although, it isn’t all positive. Fashionista.com says, “While the fur trade is associated with animal cruelty and bringing some species closer to extinction, the faux fur business (like most of fashion) often relies on harmful chemicals and cheap labor to produce millions of garments at affordable prices.” In order for us to better understand what is best when it comes to faux fur, we must look into the future of fashion. The future of fashion includes lower prices, more faux fur, and hopefully less cheap labor and harmful chemicals. Faux fur is apparently here to stay, but we must hope that it’s in a healthier and better way. Mary Seng- Happily Grey: Mary Seng defies stereotypical fashion ideals by somehow combining the edginess of a tomboy fashion sense with the bohemian simplicity of a free love child. Her blog ranges from style, to beauty, to shopping the looks. She is versatile and can definitely make an impact. Celine Aagaard- Hippie Hippie Milkshake: If high fashion minimalism sounds of interest to you, make sure to check out Hippie Hippie Milkshake. Celine Aagaard features everything from the runway to streetstyle, and even has some culinary inspiration. A worthy notation for those invested in the finer things in life. Ellen Claesson- Ellen Claesson: If you’re a fan of foreign fashion, Ellen Claesson is the girl for you. This Swedish blogger has a taste for the finer things in life, and will show you how good that they can be. Mireia Oller- My Daily Style: This Spanish fashion blogger brings color to life in new and fascinating ways through clothing and accessories. Her patterns and pleats of all hues show a brighter and spunkier side to fashion, and allow for true individuality. Tine Andrea- The Fashion Eaters: Individuality is key, and this blog is full of it! Tine Andrea shows us what it’s truly like to be ourselves throughout different photographs and inserts. Look to her for a dash of inspiration whenever you feel like you’re in need of one! These are just some of the top fashion blogs of the year, and who knows, yours could be next! Check out the blogs by following these links! Since the dawn of time, fashion is and has been tyrannically dictated by social elitists. There are rules and regulations when it comes to what you can and can’t wear, and when you can and can’t wear it. One of the most known rules is that you can’t wear white after Labor Day! But, as I mentioned in my previous article, we are living in the 21st century, an era of self expression. White is an important color that can be added to any outfit. So, I will answer the question, why do we abandon white after Labor Day? And, do we really have to? The “you can’t wear white after Labor Day” rule was created to separate the old money elitists from the new money group. Long story short, I want you to know that you do not have to abandon white after Labor Day! If it is your color- rock it! Wear what you want and wear what you love! Don’t conform to the social elitists. Conform to your style and conform to you! The Comeback Party of the Century! Come one, come all! Denim is throwing a comeback party and you’re invited! In the past, we have seen the likes of bell bottoms turn into straight-legged piped pants. Then, we saw the pipes turn into skintight jeans. Since this cultural revolution, we have seen our beloved skintight trousers turn to the deep, dark, thin threads of leggings. How did we get to this deep, dark place? This place where pants are all but see through, when they used to be thick and sturdy. When did we go from buying a pair of pants that lasted years, to buying a pair of pants that last five days? When did we loose our faith in denim? Why did we loose our faith in demin? Those questions may never have answers, but there is a light at the end of the tunnel. We are all residents of the year 2018 and we are living! The time is now and the place is here. We are in the midst of a self-love revolution and that means wearing what you love, and not conforming to the likes of anyone but yourself. That means that denim is coming back! Denim can be seen being sported through a vintage jean jacket, or a brand new pair of skinny jeans. Boot cut pants are on the rise like they’re being worn by Britney Spears again in the early 2000s, and bell bottoms are rocking out like it’s 1970. We are in the midst of a revolution where everything can be considered fashionable! This self-love, this confidence, this courage has allowed our generation to span decades of clothing and decades of denim, bringing them all together to suit people’s individual styles. I’m talking jean jackets, skinny jeans, bell bottoms, and fit and flare. You name it and it’s back with a bang. If you are interested in denim, the comeback kid, I’m going to show you the three funkiest and freshest items that I could find (on a college student’s budget of course) and where to get them! If you love pipe pants and denim, then the mom jean look is perfect for you. My personal favorites are the women’s high-rise, boyfriend fit jeans from Uniqlo for only $19.90.